Visit inside Christchurch, Oxford's most popular tourist attraction. Your guide will unveil a zany look at all-things 'Alice' plus tell you all about the making of Harry Potter at Christchurch. In addition, when possible, we also visit inside the Divinity school of the Bodleian library. Where possible, we will prebook tickets into the college, thus beating the often extreme queues. Christchurch is claimed to be the inspiration for Hogwarts Dining Hall! Christchurch entrance fee worth up to £10 entrance ticket is included in this ticket. 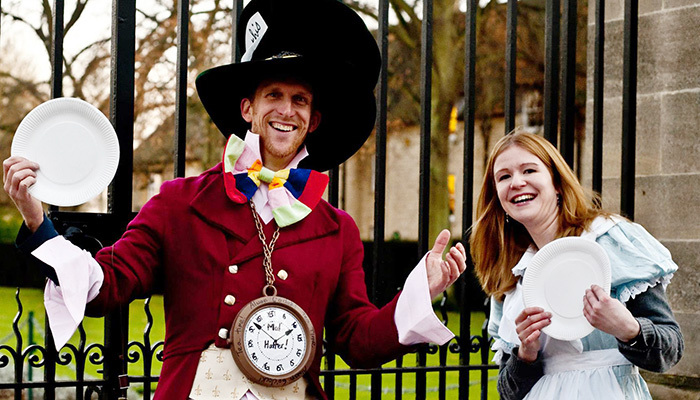 Christchurch was the home of Lewis Carroll & 'Alice' and discover how real-life events inspired the story development of Oxford's most famous story. Christchurch entry fee (up to £11 person) included+ £1 entrance to the Divinity school (Bodleian library) film site, when Divinity school open. This tour includes insights into both Harry Potter and Alice in Wonderland. As queues into Christchurch can last up to an hour in high season, we purchase advance skip the queue tickets wherever possible to do so. You can book this tour at short notice but in order to ensure avoiding long queues, please try to book this tour, several days in advance, so we can pre-purchase entry tickets! Notice: Online bookings close 2-12 hours before tour. Phone sales still possible. Small groups averaging 1-5 persons in low season. Disclaimer: we remove dates when Christchurch is fully closed but any dates when there is a partial closure, we still run the tour. On such dates, the dining hall may be closed or viewing only from door. This doesn't affect our tour as the hall is NOT a Hogwarts film site. The staircase & the cloister are the film sites.